This entry was posted in General Political Science and tagged 1988, 2000, 2008, 2012, 2016, Chris Christie, Dan Quayle, Elizabeth Dole, George HW Bush, George Pataki, GOP, Howard Baker, Iowa Caucus, Mitch Daniels, Sarah Palin. Bookmark the permalink. Unfortunately, I do not believe the polls and surveys matter. It seems to be that only the recognizable and noteworthy names standout. Even those who are in third or fourth never seem to be good enough to make out from it. I don’t believe it matters, the people know by names and not by poll numbers. Polls don’t mean anything. You are only asking a small percentage of people from one area of the country. That area might be Republican or it might be democratic so it throws everything off. N my opinion things only matter when you are voting fir United States senator and representatives. Their votes elect the president and who controls the government. I believe polls are inherently subjective and that it is almost impossible to obtain general population opinion from such a small sample size. With that said, I believe the front-runners will be Jeb Bush. Jeb Bush is described as the “smarter Bush” and has been a rumored popular Republican candidate for several years. I believe he will beat Mitt Romney for the GOP nomination, because Mitt already had an attempt at the presidency and missed it. I believe that polls do matter, because they get individuals of the United States involved in their right to vote. Every person should maximize their potential to vote on the basis of where they are from in the nation. In a way, the poll’s are a way to tell the nation what one candidate is representing and how they are affecting the nation’s judgment. As a voter, it should be one’s responsibility to look into the beliefs and ideologies of the candidates running, because every one running has their own one of a kind perspective on the nation’s policies. I don’t think polls have much meaning. They only count a portion of the population. Not everyone is able to participate in which case results in less than accurate results. It may be interesting to look at them, but mostly for the purpose of finding out why they are so off. Sadly, they don’t matter and it is very depressing. There are so many political interests and strings attached to the polls, it almost seems that it is an exercise in futility to vote. 😦 I agree with Alejandra – they are only used to take certain demographic information so politicians know how to structure their campaigns during re-election years. The polls don’t matter. It’s been reported that Mitt Romney is dropping out of the race and he was in the lead ! Surely, the people advising him realize that this poll is meaningless because if it wasn’t I don’t believe he would’ve dropped out so early. Besides, we don’t know what skeletons will come out of the closet and force some of these opponents to drop out. I really don’t think polls matter. At this day in age people don’t really care about the polls,they only care about the person and what there going to do once there elected. I think in years to come the polls will not exist anymore. at this point in time polls to me don’t matter because it is not election year and there is nothing going on. it is only 2015 and it is not 2016 and polls this year just don’t matter. 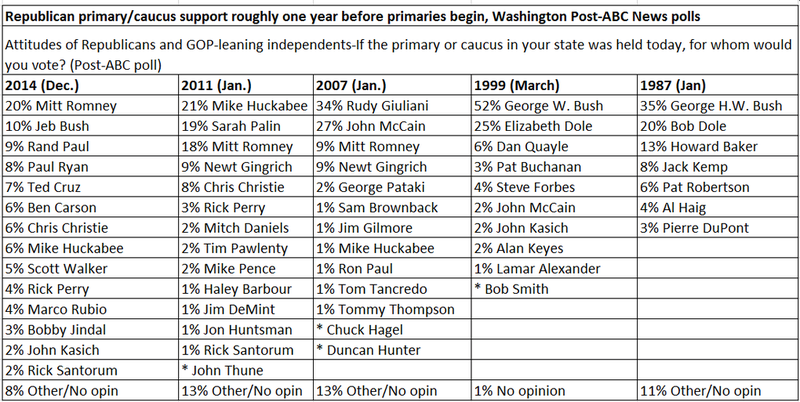 and also polls are inaccurate sometimes and provide to clear front on who is winning and who is trailing. But I think that is the coming years polls will still be around just for people to see who is in the lead. Polls aren’t entirely accurate because often opinions aren’t taken from a more diverse group of people and therefore the “public opinion” can in turn become bias and one sided. Often not enough people vote in presidential elections therefore the public opinion might not be the majority opinion. I do not believe that the polls actually matter. There is only a small amount of people who even take part. Polls are inaccurate and have a high number of inaccuracy, therefore I think polls are completely unnecessary to even look at. I don’t believe that polls are very important anymore. Polls only take a small group of people and give them the chance to express their opinion. Polls do not give accurate representation or statistics because the actual group being measured is small, rather than polling everyone as a whole. Groups can be bias and numbers can always be misconstrued.